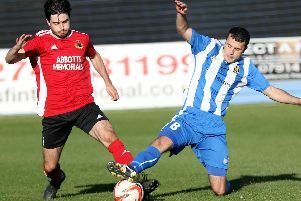 Knaresborough Town climbed to the top of the NCEL Premier Division standings in dramatic fashion on Tuesday night. Dan Thirkell's 93rd-minute winner ensured that Paul Stansfield's team left Thackley with a 1-0 victory to their name, jumping from fourth place to first in the process. Boro began brightly in West Yorkshire, Josh Garbutt rattling the underside of the cross-bar before Rob Youhill fired just over the top. The game got scrappier as it progressed and although the second period began at a frantic pace there was little to choose between the sides approaching the final whistle. The deadlock was however broken deep into injury-time, defender Thirkell powering home a bullet header from substitute Ben Cohen's corner. 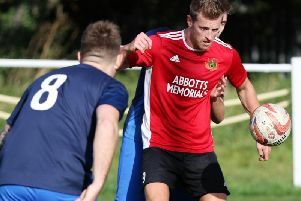 The result means that the Manse Lane outfit, who are playing in English football's ninth tier for the first time ever, are top on goal-difference, level on points with Hemsworth Miners Welfare, but having played a game less. ”A draw would probably have been a fair result but when you’re playing well and on a bit of a roll, things tend to go for you," Stansfield reflected. “Thackley had settled for a point with five minutes to go, they made some defensive substitutions, while we kept pushing and in the end it was an absolutely fantastic header that won us the game."